I am delighted to introduce the Eye Safety Card which is something I have been developing this year. The Eye Safety Card is designed to help non-professional members of your optometry practice team to help identify patients who may have a serious eye condition as they present to the practice. Often the first person a patient will present to will be a receptionist or member of the dispensing staff in a practice. So this is a vital opportunity to detect any ‘red-flag’ symptoms the patient may have as being something that needs to be examined urgently. This double sided A4 card is intended to be kept in practice reception areas, so that when a patient presents with a significant ocular complaint, it will help prompt staff members to either give the patient an urgent appointment or at least to discuss with the optometrist, rather than risk giving the patient an appointment several days or a week away. I hope that that as well as helping staff in this respect, it will also be an interesting tool to have at the reception desk, in helping to engage all staff with the healthcare aspect of optometric practice. 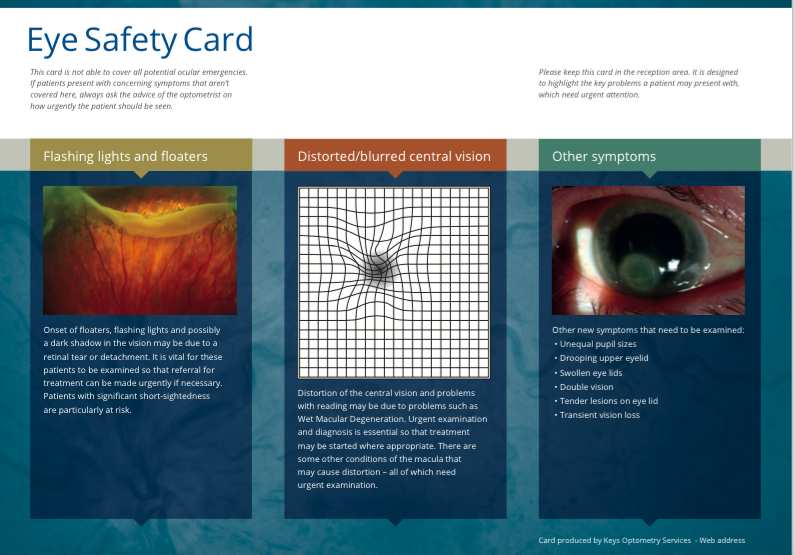 The image gives a preview of the card, which covers key areas such as visual distortion, flashes and floaters, sudden visual loss, injury and painful red eye. It is a double sided A4 in good quality, durable laminated card. The cards can be ordered by filling out the Eye Safety Card order form page which can be found by clicking the black tab on the top right of this page. Alternatively you can email me directly with the number you would like and postal details at stanleykeys1@icloud.com. Anyone interested in making a large order for multiple businesses please email me for a quote. Likewise any event organisers who wish to purchase a bulk order of these cards to include in delegate packs, please get in touch.